CENTRAL Province Road Transport and safety Agency (RTSA) manager David Manjulunji has called on the Kabwe Municipal Council to address the issue of indiscriminate parking by truck drivers citing this as one of the causes for accidents. Mr Manjulunji said the issue of truck parking in the central business district in Kabwe is an issue of grave concern to RTSA, especially trucks carrying flammable and hazardous goods. “The parking of trucks in the central business in Kabwe is a recipe for disaster, especially the trucks carrying flammable goods as they park close to the filling stations and should a fire break out, the whole town centre would be gutted,” Mr Manjulunji said. He said this at the weekend during the World Day of Remembrance of road traffic accident victims’ memorial service at Ebenezer Church in Kabwe. He called for close collaboration with the local authority to address issues that threatened the lives of pedestrians. Mr Manjulunji said that the issue of billboards in various spots around town and highways had also become a public concern as they were erected in a manner where pedestrians and other road users were obscured from seeing oncoming traffic. He called on the public and organisations to seek RTSA’s road safety specialisation before engaging into such practices because ultimately, there was no winner when an accident happens. Kabwe Mayor Richard Bango said the council did not allow the trucks to park in town and that the trucks that parked in the town centre did so illegally and were equally worried with the effects of such activities. Mr Bango said the municipality had found alternative land for the construction of a parking area for the trucks and had put up road signs that indicate to the truck drivers that they should not park within the town centre during the day or night time. “As a council we are very much concerned with the safety of the residents and it is for this reason that we have put up road marks in the town centre to ensure that traffic flow is not interfered with, we are ready to collaborate with RTSA any time we are called upon,” he said. 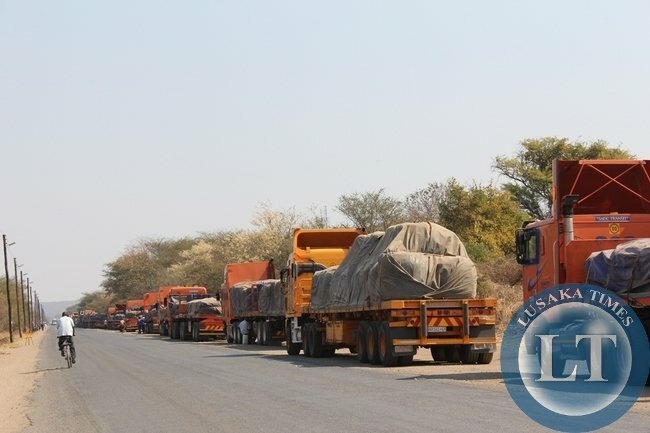 TANZANIA apologises to Zambia for accidents caused by its truck drivers. People die at Chibombo and you are talking about truck drivers in Kabwe. How many accidents have been caused by parked trucks? And Bango says they park illegally so who is going to move them if not you? Whilst in lusaka trucks are not allowed to through the CBD like Cairo road so as in Kitwe.But in Kabwe trucks go through the CBD.The main road for trucks goes straight through town.Why not construct a road which trucks shoulb be using that should go on the out skirt of town?Chibombo area esp pa John where main lives have been lost should be an area of concern to central province.Do something for we have approched the rain season the road is slippery too.